One of the main criticisms we had of the outgoing GMC Acadia midsize crossover was its subpar exterior styling. It lacked character and could easily go unnoticed. Not anymore. 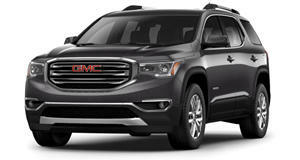 Introducing the refreshed 2020 GMC Acadia, which not only features styling directly from the latest Sierra 1500 and Sierra HD but also a new turbo four engine and the introduction of a new trim level, the off-road-focused AT4. Let’s start with the styling. Up front, there’s a redesigned grille, new front and rear fascias, standard LED lighting and the brand’s new signature C-shaped head and taillights. The AT4 has a slightly more aggressive style thanks to a black chrome finish. GMC wants to position the Acadia AT4, the latest member of its AT4 sub-brand, as a premium though not all-out luxury crossover capable of handling itself in a more rugged situation. It’ll come powered by the familiar 3.6-liter V6 with 310 hp and 271 lb-ft of torque paired to a twin-clutch sending power to all four wheels. Seventeen-inch wheels are standard while 20-inchers are optional. Aside from the new exterior styling and AT4 trim, the other major highlight is the introduction of an all-new dual-scroll turbocharged 2.0-liter four-cylinder with an estimated 230 hp and 258 lb-ft. It will be standard on SLT and Denali models, while the base 2.5-liter inline-four will carry over from last year unchanged. A new nine-speed automatic transmission will be standard on all 2020 Acadia trims, and it will be controlled by GMC’s Electronic Precision Shift, a system that replaces the stick and push buttons and pull triggers. Inside are a number of interior refinements, such as redesigned and more spacious center console, enhanced eight-inch infotainment system, and a new head-up display. Top trim Denali models feature open-pore wood decor on the dashboard and a new color scheme. Sales of the 2020 GMC Acadia lineup will get underway this fall with pricing to be announced at a later date. Production will continue to take place at GM’s Spring Hill, Tennessee, assembly plant. What broken glass can teach you about a car. Clark Griswold and crew would gladly take this luxury crossover to Walley World.